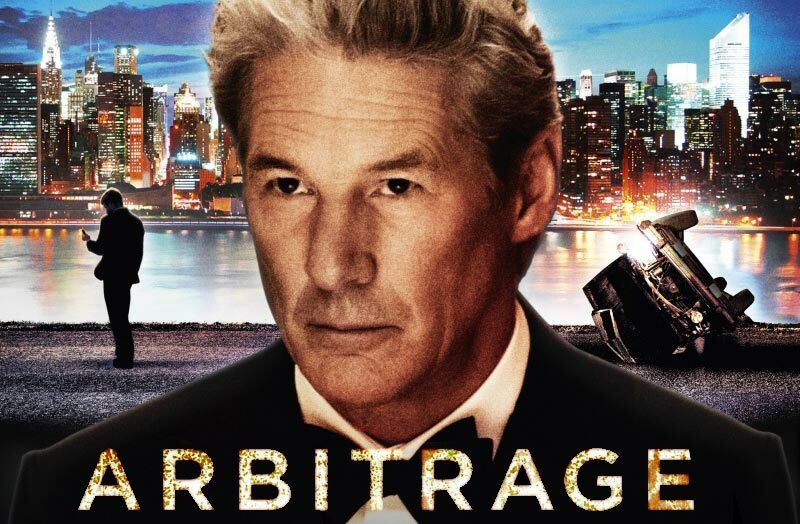 Richard Gere achieves the impossible in Nicholas Jarecki’s thriller Arbitrage: he makes us sympathize with an arrogant, ruthless (but charming) hedge fund magnate whose empire is threatened by some poor financial and personal choices. When we first see Gere’s Robert Miller, he is on the verge of selling his venture capital company to the elusive Mr. Mayfield (Graydon Carter), while celebrating his birthday surrounded by family and friends, including Susan Sarandon as his philanthropic wife and Brit Marling as his daughter and business partner. Yet, there are troubles lurking around every corner: the deal is not set, an audit has to be approved, the financial vultures are circling-- and there is Miller’s very needy European artist/ mistress (Laetitia Casta) who will be very upset if he misses her opening. An impulsive decision to assuage his mistress leads to a horrific accident (if you want to think a landlocked Chappaquiddick, I’m not stopping you) and some desperate maneuvers to avoid financial ruin and imprisonment. Arbitrage ratchets up the tension as Miller is forced to rely on the other protagonist: his proud, unwitting accomplice Jimmy Grant (Nate Parker), a young black man with a record (which allows Jarecki to skillfully introduce troubled race relations and America’s class structure) who rebuffs Miller’s attempt to “buy” his loyalty, especially since he has no intention of doing the dishonorable act of selling Miller out—even when threatened by a dogged cop (an entertaining Tim Roth) with supposedly damning evidence. These scenes between Gere and Parker—abetted by Stuart Margolin as Gere’s shadowy adviser--are among the best in the film. Parker excels as Grant, a young man with a sense of honor and loyalty that is unknown in Gere’s rarefied circle of acquaintances. Miller’s mistaken belief that all will be fine if you throw money at it (his business dealings, his mistress, his wife) doesn’t hold with Grant, and leads to a severe crisis of conscience-on both parts. Gere brings out Miller’s humanity even as he contemplates letting Grant take the fall; other scenes give Gere full rein to display the driven, desperate, dynamic machinations of a man who has forced himself to believe that all his actions are for the greater good of his investors. It’s a terrific, skillfully shaded performance in a taut, extremely entertaining film that encourages the audience to take a rooting interest in Robert Miller’s plight without downplaying the character’s questionable motivations and financially fraudulent actions. Fraud of a different kind is the subject of The Words, a flawed but not altogether uninteresting look at what can happen when the creative process decides to employ a short cut. In the framing story, Dennis Quaid is a successful author who is supposedly regaling his audience at a reading of his new book. However, his ponderous narration (which would have driven his audience into a lengthy stupor), magnified by a syrupy score, tells the story of a struggling writer (well-played by an earnest Bradley Cooper), his lovely wife (Zoe Saldana, attractive and under-used)—and the battered briefcase that his wife bought for Cooper on their Paris honeymoon. After Cooper’s latest novel is rejected (it’s too good) and he is forced to finally take a job (gasp—and -with a literary agency, no less), he finally gets around to looking in that briefcase, and lo and behold, what’s in there but a very old manuscript, both legible and literary. After he types it into his laptop, Zoe reads it (unaware of its origins), gushes over it (and this new literary lion she’s married) and convinces him to give it to his employer/publisher. The book becomes a hit, his earlier books get a second look, and everything is hunky-dory --until this mysterious old man (an ultra-weathered Jeremy Irons) shows up with some damning information. The “tension” mounts. Will Irons claim ownership of “the words? Will he exact revenge? Will Cooper fess up? How will this affect his love life? The real letdown is that Brian Klugman and Lee Sternthal, the authors of these Words establish what might have been an intriguing premise-- and then proceed to deal with it in a most pat and perfunctory manner. The fact that Cooper is a fictional character in “the story within the story” only serves to further distance the viewer from his plight. Moreover, the flashbacks wouldn’t have been out of place in a Lifetime movie while the framing device (with Olivia Wilde as an attractive, inquisitive fan) doesn’t really add anything of consequence—although I’m sure it was meant to add weight. You may want to wait for the DVD.